Major General ® Syed Ali Hamid of Pakistan army wrote an excellent profile of MG Anant Singh Pathania. Absolute delight for folks like me. My comments in red. Great profile of an officer and gentleman. How could I resist as it opened so many windows of a bygone era. My few cents in red. I’m circulating it to my list. MAJ GEN ANANT SINGH PATHANIA, MVC, MC. 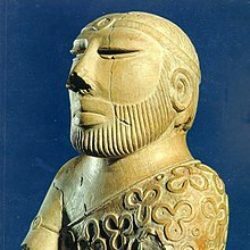 The clan of Pathanias were originally Tomars from Rajasthan and for a while they ruled Delhi. 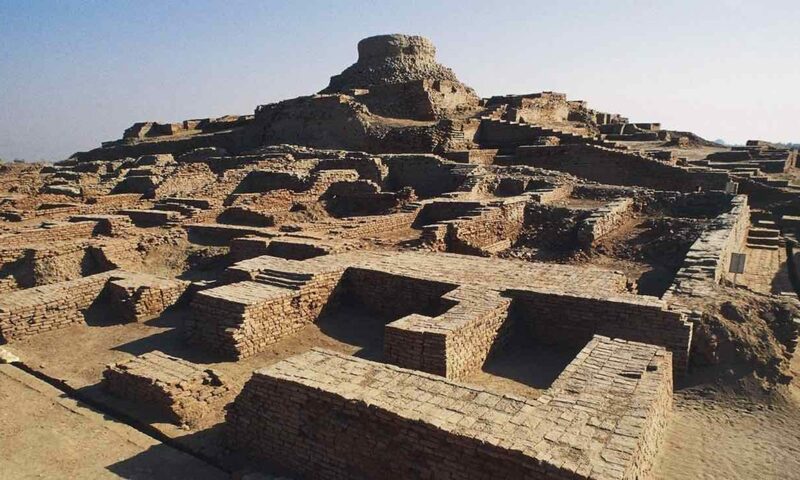 They moved up north after being defeated by the Moguls and their name is an abbreviation of Prathishthana, the ancient name of Pathankot, which was the capital of the hill state of Nurpur. They have a proud record of service in the armies of Maharajah Ranjit Singh, the State Forces of Jammu & Kashmir, the British India Army and the Indian Army. The clan boasts of one Vir Chakara and two Maha Vir Chakaras (the second highest gallantry award in India), and one of the recipients was Anant Singh Pathania who was twice decorated for bravery and retired as a major general. 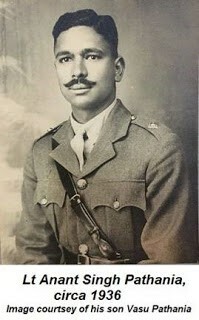 He was born in Kangra, Himachal Pradesh in 1913, just two years before his father Lt Col Raghbir Singh Pathania, 2nd Jammu & Kashmir Rifles was killed in action while commanding the battalion in Jassin, Tanganyika. (Kashmir contributed one and a half battalion for Expeditionary Force B for East African campaign. One complete battalion 2 J & K Rifles and half battalion (4 companies) 3 J & K Rifles. Class composition of 2 J & K Rifles commanded by Lt. Colonel Raghbir Singh was 50% Muslims and 50% Gorkhas. Class of composition of half the battalion of 3 J & K Rifles commanded by Lt. Colonel Durga Singh was 50% Dogra and 50% Gorkha. 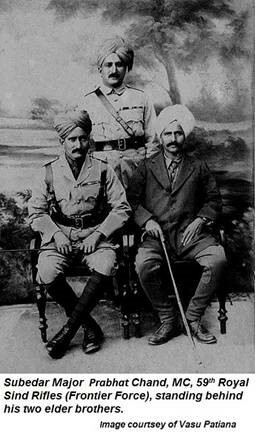 Raghbir Singh was killed at the head of his troops defending an outpost on 18 January 1915. State troops fought well but post was overrun next day. Out of 135 Kashmir troops captured, 115 were wounded that tells a lot about the fight.) His mother was the daughter of Gen Baj Singh, Kashmir Imperial Service Troops, a fine old soldier and gentleman who was always keen to be in the thickest of a fight. He was shot down next to Capt. Townshend, leading an assault during the Siege of Chitral, 1895. (Three battalions of Kashmir Rifles; 4, 5 & 6 were deployed in northern areas in 1895 campaign. 4 Kashmir Rifles commanded by Colonel Jagat Singh was at Gilgit and when Chitral was threatened, it was dispatched to Chitral. That old soldier General Baj Singh although not required went with the battalion to make sure that is was steady in a crisis. Captain Townsend with 400 soldiers was besieged in the fort. During a heavy attack a number of Kashmir troops were killed including Baj Singh and Major Bikham Singh of 4 Kashmir Rifles. Charles Verre FerrersTownsend was an interesting character and also present at the battle of Ombdurmam in Sudan. He rose to become Major General and during Great War commanded 6 Division in Mesopotamia. After initial successes, his command was destroyed at the siege of Kut al Amara and he surrendered to Ottoman forces ) Anant Singh was raised under the tutelage of his grandfather Maj Gen, Sardar Bahadur, Nihal Singh Pathania, OBI, the C-in-C of Jammu & Kashmir Forces. It was around this time that he was engaged to a lady whose family could boast of an equally strong military heritage. Her father, Col Bakshi Chand Katoch was awarded an IDSM in Mesopotamia when he was the Subedar Major of the 56th FFR. He was subsequently commissioned with the first batch of KCIOs from the Cadet College, Indore in Dec 1919.Maj Gen Akbar (Rangroot) who was PA-1, was also commissioned in the same batch. Her younger sister was married to Ghanshyam Singh who was in the last batch of KCIOs commissioned from Sandhurst in 1934 and was posted to 16th Cavalry. My father Maj Gen Syed Shahid Hamid was in the same batch.Her uncle (father’s younger brother) was Subedar Major Parbat Chand Katoch, the first Indian officer (VCO) to be awarded a MC in WW1. 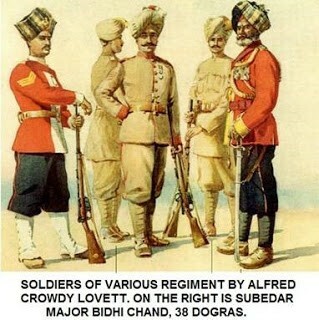 When all the British officers became casualties at Neuve Chapelle, Prabhat Chand then just 30 years old, splendidly led the remnants of his regiment, none other than the 59th Royal Sind Rifles (Frontier Force), which in the reforms of 1921/22 would be renumbered as the 6/13thRFFR. Her grandfather was Sardar Bahadur, Honorary Captain Bidhi Chand, the first Subedar Major of 38thDogra (now 2 Dogra. The recruitment pattern during necessity of Great War is very interesting. On the eve of Great War, infantry battalions consisted of eight companies. In 1915, a Jat K company and later two L & M companies of Garhwali Brahmins were added. Later, during four company re-organization battalion had four Dogra Rajput companies but also retained K Jat and M Garhwali Brahmin companies. In Second World War, other regiments with Dogra component also recruited new classes. 5th Probyn Horse recruited Dogra Brahmins and Baluch regiment Brahmins from non-Dogra areas. This added to administrative headache as in Probyn’s Horse instead of squadron mess for a single class troop messing had to be implemented as Brahmin Dogra would not eat with Rajput Dogra.) who held the appointment for 18 years till he retired in 1909. His fiancés parents were keen to quickly tie the knot, since girls in their family wed as young as fourteen, but Anant’s battalion was fighting in Waziristan and he did not want to take a chance. The family agreed to wait. He joined his unit at Razmak along with his course mate, Bakhtiar Rana who was promoted to a three star rank in the Pakistan Army. Most of the Muslim officers that he served with in the battalion during this campaign including Shaukat Raza, Sher Khan, Nazir Ahmed, Akbar Khan and Muhammad Musa, would also rise to prominence in the Pakistan Army. When the campaign terminated in 1939, Anant Singh was detailed for the Junior Staff Course. By the time he returned to the battalion it had moved to Secunderabad as part of the newly raised 5th Indian Division. The formation was under equipped as it was foreseen that the British India Army would not fight a ‘first-class enemy’. 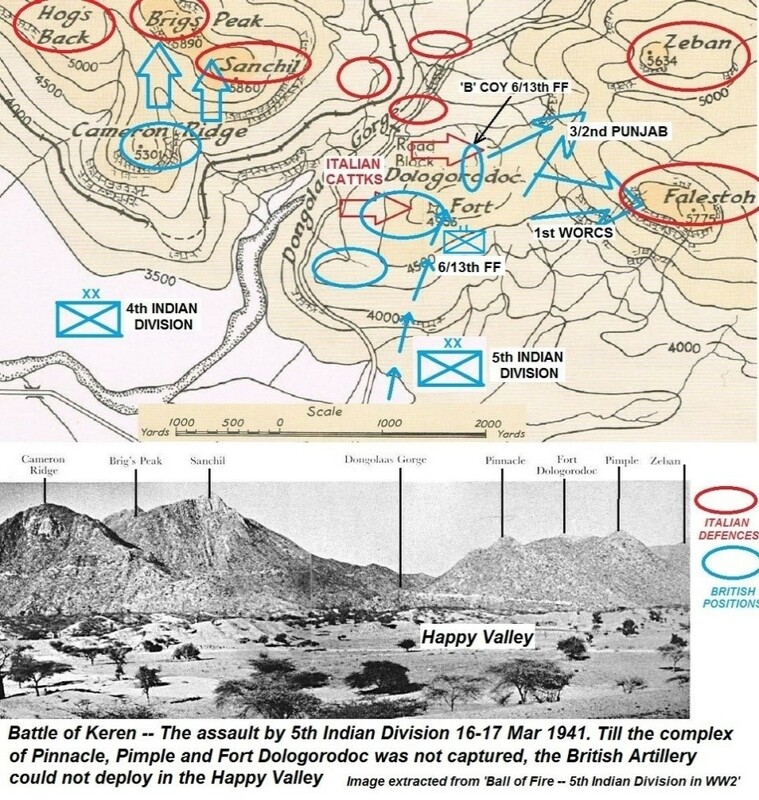 However whatever might have been said against the Italians, the Battle of Keren in Eritrea was one of the toughest engagements fought by the 5th Indian Division. 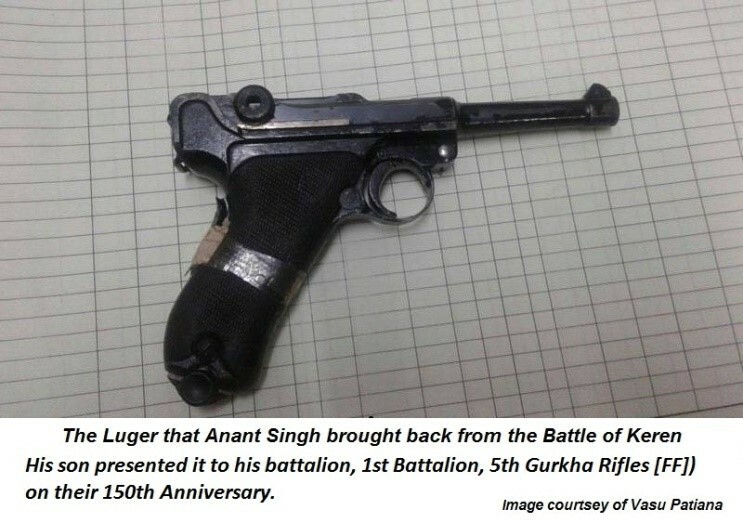 To a large extent the division owed its success to the experience of a number of its battalions like the 6/13th RFFR who had operated on the North-West Frontier. The division was shipped to East Africain Sep 1940. By the time the battle for Keren was fought in early 1941, Anant Singh had advanced to a temporary captain and was commanding a company. Keren is located on a plateau 4,300 ft above sea level and astride the only route that led to Asmara. A formidable barrier of bleak and jagged peaks guarded the approach through the narrow Dongolaas Gorge which took the road and railway up to the plateau. The initial attacks in Feb and early March by the 4th and 5th Indian Divisions on the mass of mountains which rose some 2,500 ft above the Happy Valley, met very limited success. The Italians were too well entrenched and from their excellent observation posts they could detect and engage every movement. Moreover, the physical effort of climbing through prickly bush, spear grass and rocks with no foothold, so exhausted the attackers burdened with equipment, weapons, ammunition etc. that on reaching the crests they were momentarily too exhausted to make further effort. That’s when the Italians counterattacked. Ultimately the British commanders decided to force a passage by narrowing the frontage of the attack to just 3000 meters astride the gorge. 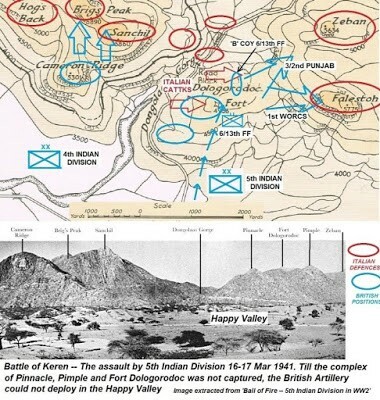 A renewed effort by the 4th Indian Divisionon the left to capture Brig’s Peak and Sanchil again failed. 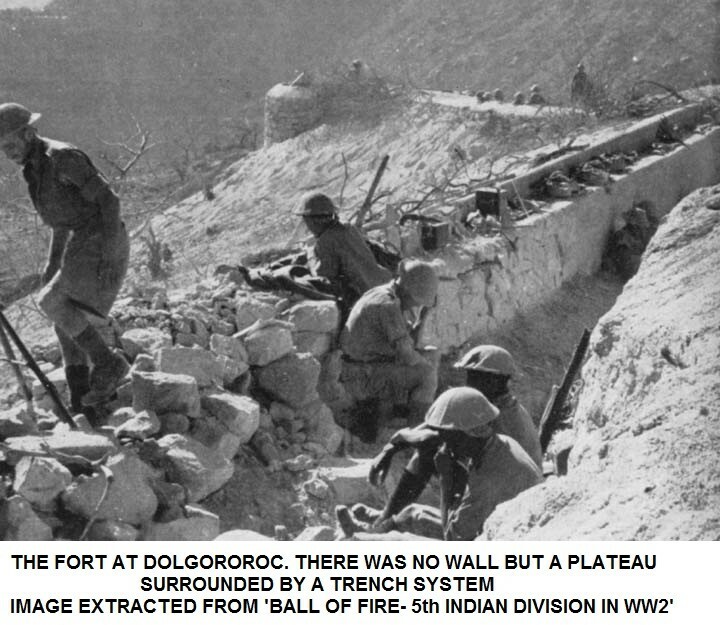 However, a brigade of 5th Indian Division commanded by Frank Messervy managed to ascend a spur on the right and after some bitter fighting captured Dologolodoc Fort. That night the next brigade of which 6/13th RFFR was the reserve battalion passed through to assault Zeban and Falestoh. The attack was held-up halfway and early next morning, the flank of 3/2ndPunjab (the left forward battalion) was counterattacked. 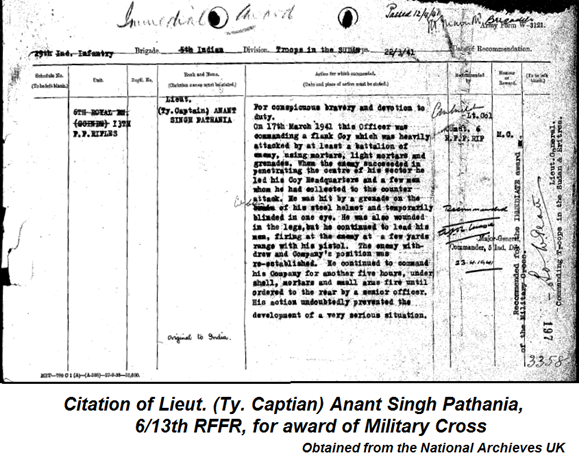 ‘B’ Company 6/13thRFFR commanded by Anant Singh was sent forward to assist in repulsing the Italians. The ground over which it had to pass was swept by machine gun fire from across the gorge but the company made a rush, captured forty Italians and held ground. Throughout the morning in temperatures touching 40°C and amidst heavy shelling, the rest of 6/13thcarried water, rations and ammunition up to the forward battalions. Its HQ was heavily shelled but with coolness and diligence, the adjutant Maj Sher Khan kept is operating efficiently. In spite of the best efforts of 6/13thRFFR and air supply mission,the Worcestershire Battalion on the right was critically short of ammunition and in the evening withdrew to a depression ahead of Fort Dologoroc. As it was withdrawing, Anant’s company out on the left flank was heavily counterattackedby the better part of a battalion of Savoy Grenadiers who were among the finest troops the Italians had. In spite of losing a third of its strength the company gallantly held its ground. The history of the division records that the company commander ‘displayed magnificent courage and leadership in this action’. When the Italians succeeded in penetrating the centre of his sector, he led his company HQ and a few men whom he had collected to the counter attack and at the point of the bayonet pushed the Italians out from his company’s position.Though wounded in the face and both legs, Anant Singh was not prepared to be evacuated and only did so five hours later under orders. The command passed to his company officer, Lt. Sadiqullah. The Savoy Grenadiers rallied and launched another attack but the officer handled the situation very well. In the nick of time the company was reinforced by two platoons and Sadiqullah led a charge and again drove the Italians back at the point of the bayonet. 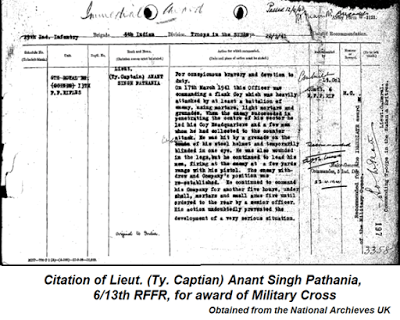 For conspicuous bravery and devotion to duty, Anant Singh was awarded a Military Cross. Young Lt. Sadiqulla was also awarded a MC in a subsequent battle but that is another story to be told. Anant Singh returned to India to recover from his injuries. While in hospital, he was visited by Maj Gen Inskip who commanded 6/13th RFFR in Waziristan from 1932-34 and was now commanding the Rawalpindi District. Inskip had been awarded an MC in WW1 and he pinned a miniature of the medal on Anant’s shirt that had been presented to him by a Count. Anant confided to the general that he was still in possession of an Italian Lugar that he was grasping when evacuated from the frontline and the general replied “Keep your mouth shut and retain it as a memento”, which he did. It was rumoured that his leg had been amputated and his fiancés mother wanted to call off the wedding. Col Katoch was sent to the Pathankote Railway Station to meet Anant Singh (who was on his way to Jammu on medical leave) and confirm if the groom-to-be was whole and intact. That night two very drunk soldiers arrived home. The father-in law-to-be had pulled out a bottle of Scotch to celebrate and together they ‘killed’ it. In 1949 Anant Singh was promoted brigadier. For the next ten years he held various command and staff appointments and was promoted major gen in 1959. While recently appointed as the Director General, National Cadet Corps in 1962, on a short notice of few hours, he was sent to command the 4th Mountain Division in NEFA. The debacle of the Indo-China War muddied the career and reputation of many officers of the Indian Army including Anant Singh who had so far a fine record of service. The General retired in early 1965 and the warrior breathed his last in Dharamsala on 19 Dec, 2007 at the age of 95 years. (Interestingly, his paltan mate Sadiqullah Khan also passed away at the ripe age of 99 in 2009. I’m sure Anant and Sadiqullah are enjoying each other’s company up there and looking down and smiling on the younger generation of PIFFERS). Authors Note: I am immensely grateful to Vasu Pathania for having shared with me so much information, anecdotes and pictures related to his late father. My deepest thanks to Sushil Kumar for providing me the bio data as well as citations of the general as well as his relatives mentioned in this article. The major details of the Battle of Keren (including maps and images) have been extracted from ‘Ball of Fire’, the WW2 history of the 5th Indian Division.